The articles here deal with liturgical music. Two topics receive special attention: the curiously negative role that musical instruments play in ancient cult music and the development of ecclesiastical song in early Christianity. The first series of articles treats classical Greek ethical notions of instruments, the status of instruments in Temple and Synagogue, and the absence of instruments from early Christian and medieval church music. The next parts trace the psalmody and hymnody of the Christian tradition, from its roots in Judaism to the origins of Gregorian chant in 7th-century Rome. Throughout, the writings of the Christian Church fathers such as Augustine, Ambrose, Basil and John Chrysostom underpin the author’s analysis and presentation. Contents: Introduction; Jubal vel Pythagoras, quis sit inventor musicae? 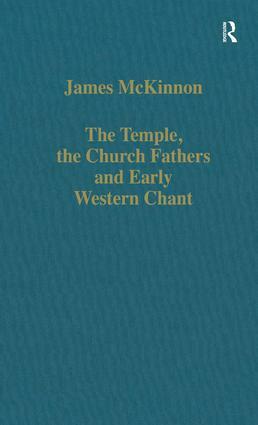 ; The A Capella Question: The rejection of the aulos in Classical Greece; The exclusion of instruments from the ancient Synagogue; The meaning of the patristic polemic against musical instruments; Musical instruments in medieval psalm commentaries and psalters; The 10th-century organ at Winchester; A capella doctrine versus practice: a necessary distinction; The Psalmody of Jewish and Christian Antiquity: On the question of psalmody in the ancient synagogue; The 4th-century origin of the gradual; Review of Aimée Georges Martimort, Les lectures liturgiques et leurs livres; Desert monasticism and the psalmodic movement of the 4th century; Preface to the study of the Alleluia; Toward early Western Chant: Properization: the Roman Mass; Lector chant versus schola chant: a question of historical plausibility; Antoine Chavasse and the dating of early chant; Iconography: The fifteen Temple steps and the gradual psalms; Index.